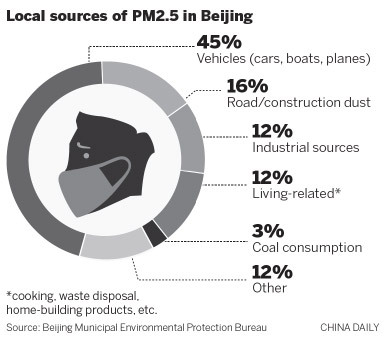 Coal burning is no longer a major source of PM2.5 in Beijing, while car emissions have become the top cause, according to a study released by Beijing's environment watchdog Monday. The worse the air pollution in Beijing is, the bigger the contribution from outside pollutants, the latest research found. When the capital has been hit with heavy pollution, the proportion from outside pollutants went up by about 55 to 75 percent.